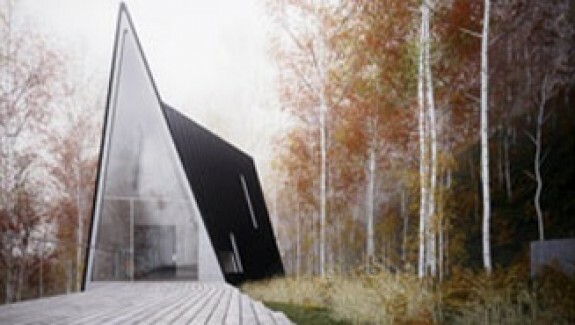 Fancy a modern home in a forest location? 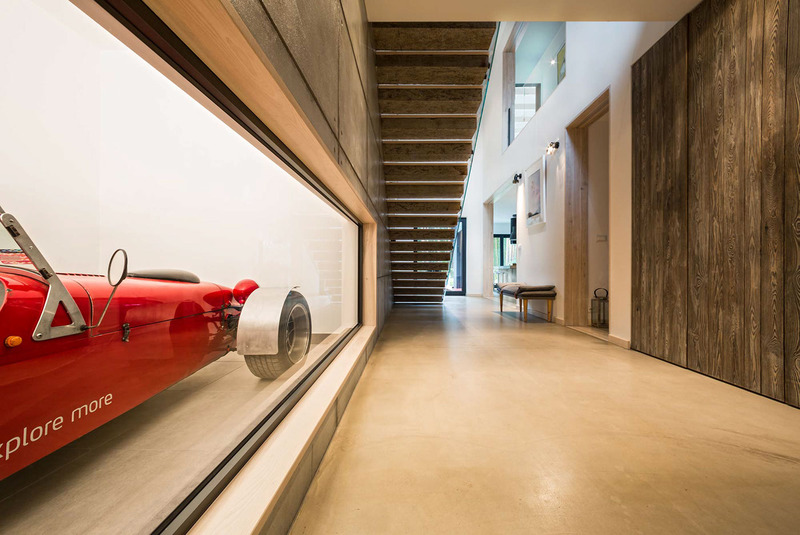 This two-storey takes the traditional home, cuts it in half, and adds a legal track car in the centre. 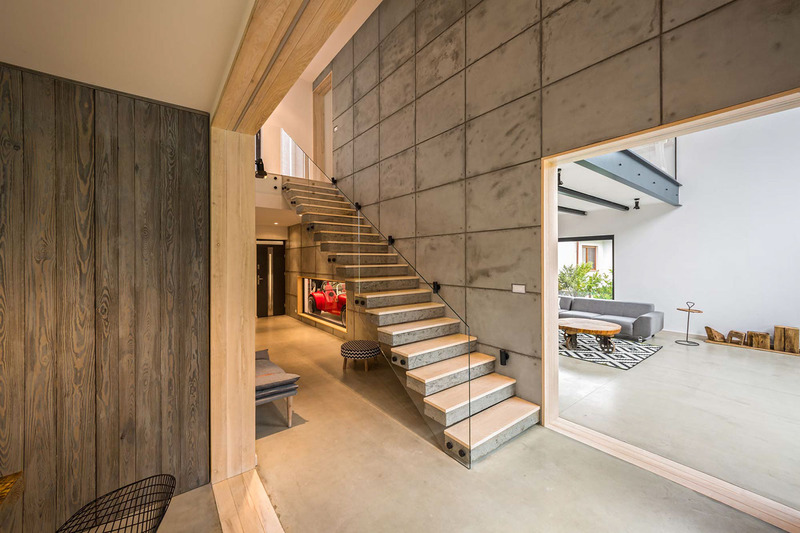 Framed by rows of alternating fencing, this Borówiec, Poland home dubbed the ‘Fence House’ uses bricks, concrete and sheet metal to achieve its industrial look. 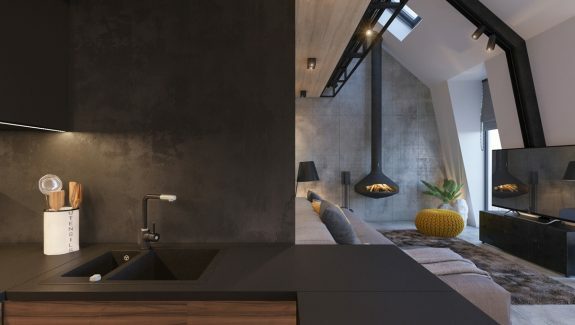 Designed by mode:lina architekci, its features block out unnecessaries, making the most of features. 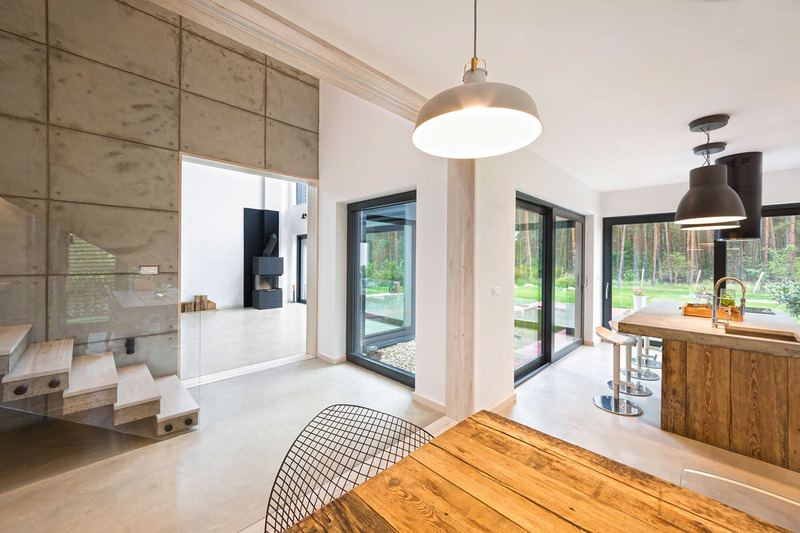 Large glazed windows face the forest, protecting the family from noise. 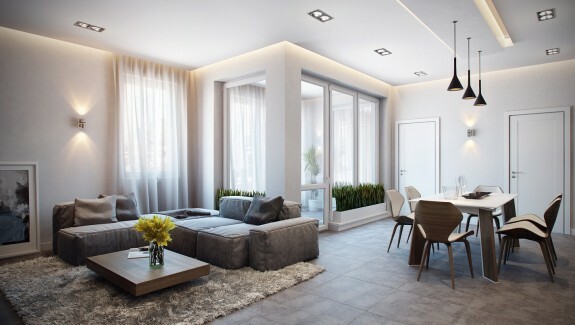 Inner windows and separate living quarters give kids and parents the freedom to live in their own style. Take our picture tour below. 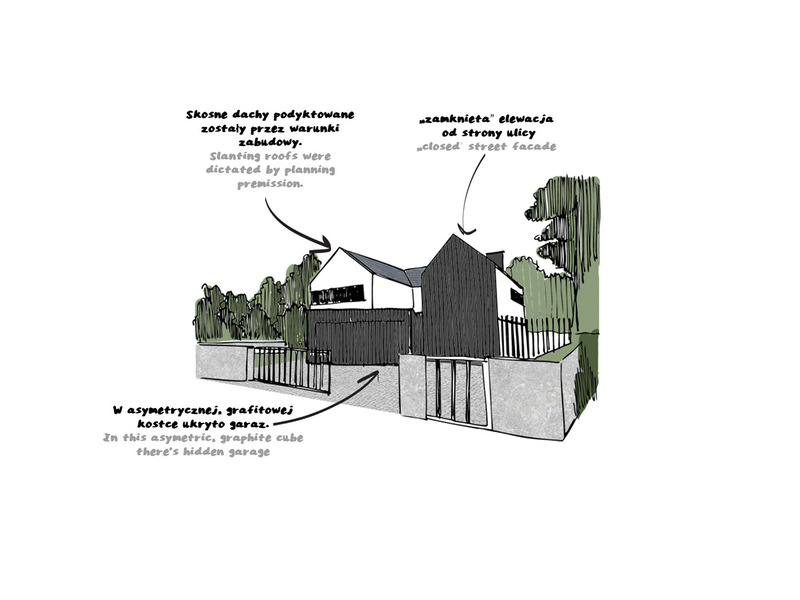 A drive up to the property reveals two traditional houses, separated by one central garage. 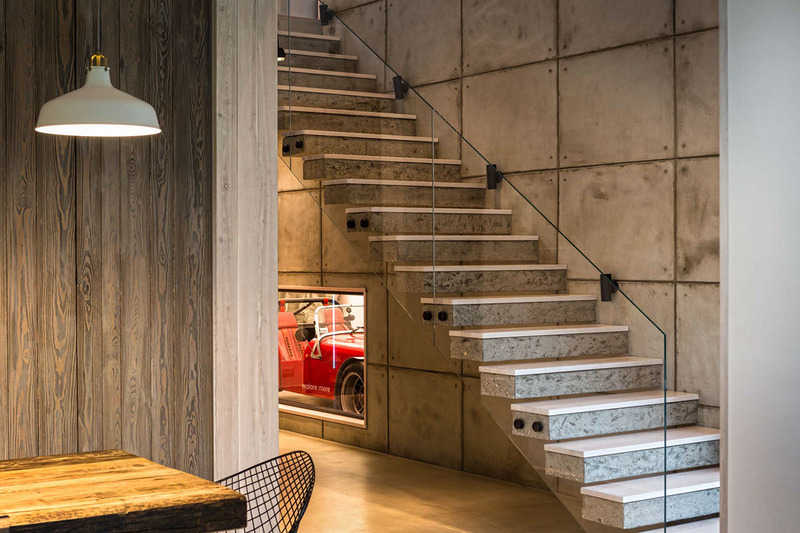 Clad in corrugated iron and plaster, its look is contemporary and subtle, with a hint of the industrial. 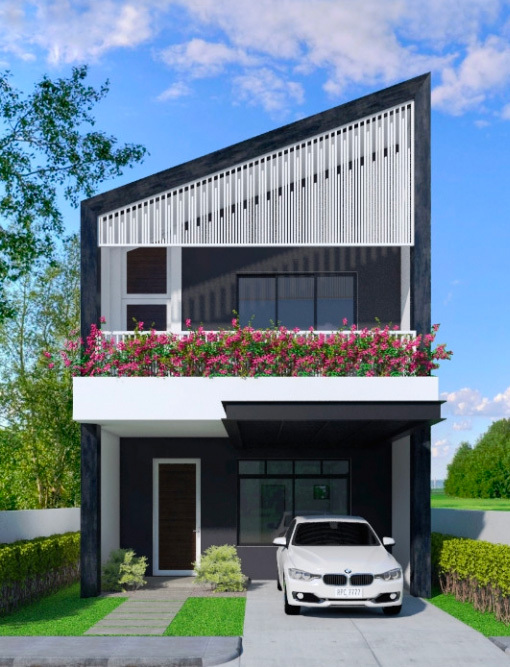 Using minimal windows on its street-facing side, this family-of-four-designed home blocks unwelcome noise. Reaching around the home’s side, large glazed windows wow beside charcoal brick pillars. A glossy outdoor patio leads to two brilliantly-lit areas, both teeming with modern warmth and views of the forest. 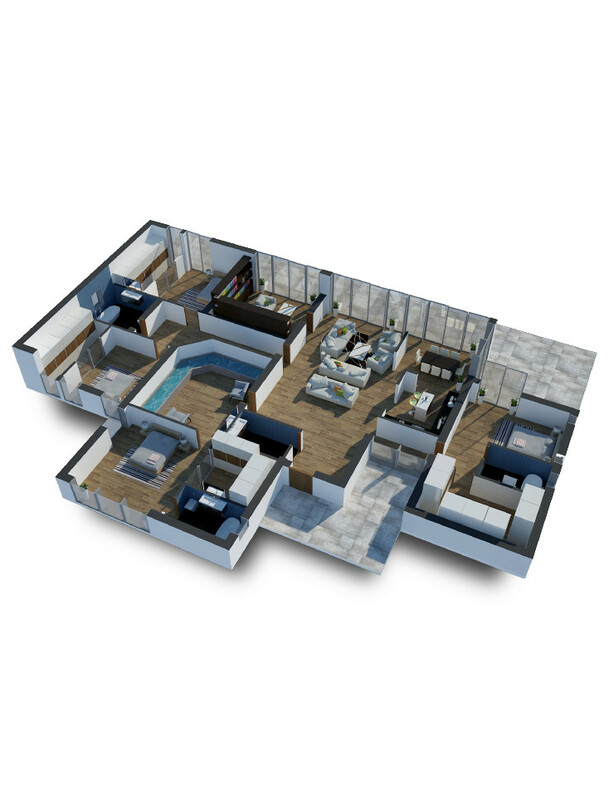 Divided by a central feature pool, the left side houses the kids, the right, the parents. 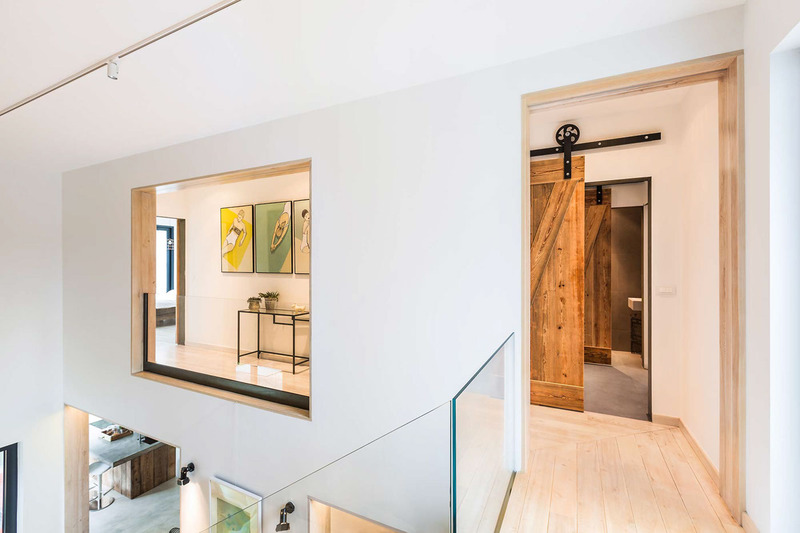 A central ground floor living space unites the two. 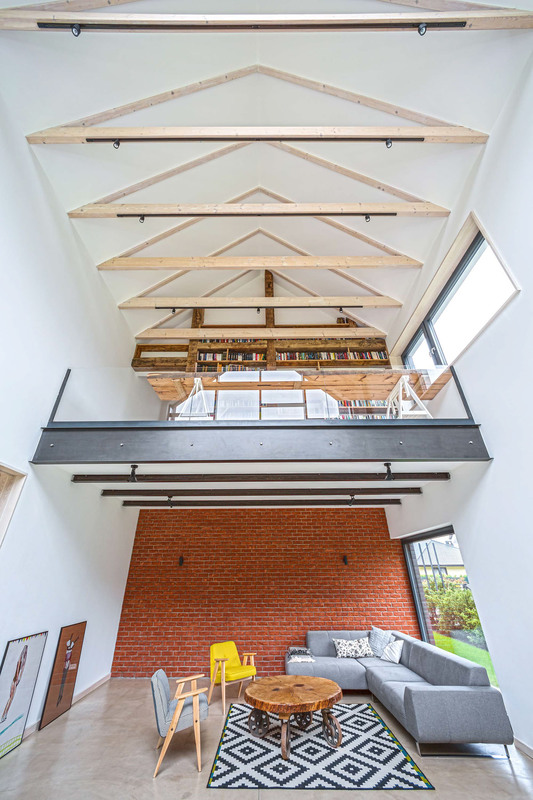 In the centre, a common living room backgrounded in brick invites in the exterior, using irregular window framing. Art deco features pop through the space in grey and yellow seating, leaning portraits and a geometric rug. 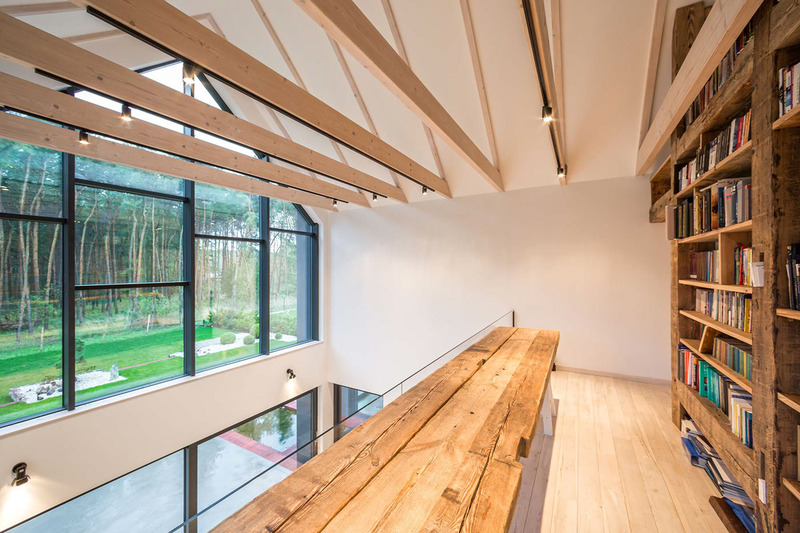 Metal ceiling trusses finish off the look. 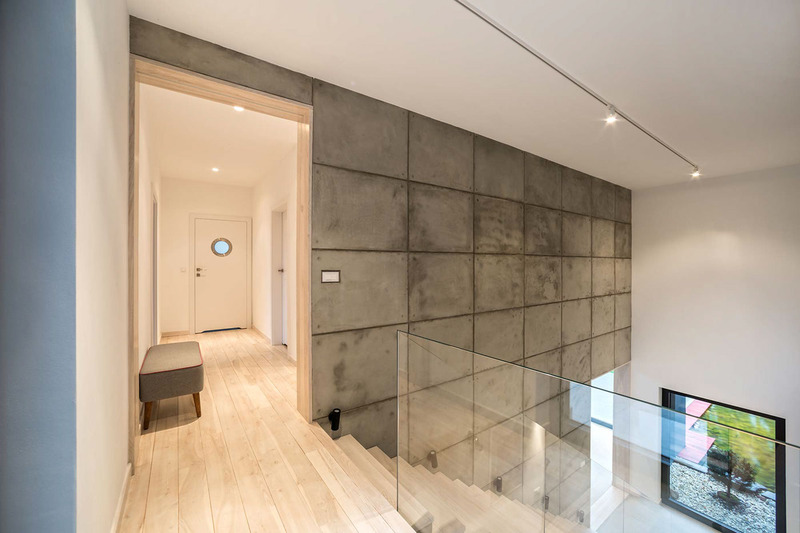 Leading up the stairs from the living room, concrete mixes with grey and light wood to create a clean, yet rustic, feel. 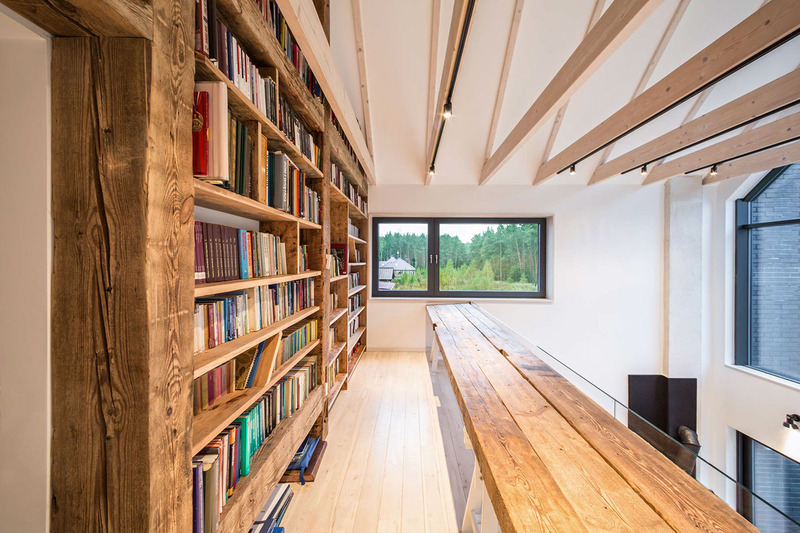 A feature bookcase celebrates the forest with old oak panelling from a Poznan townhouse. New and old wood oscillate against a glass safety panel and wide glazed windows. A bench seat offers a space for reading. 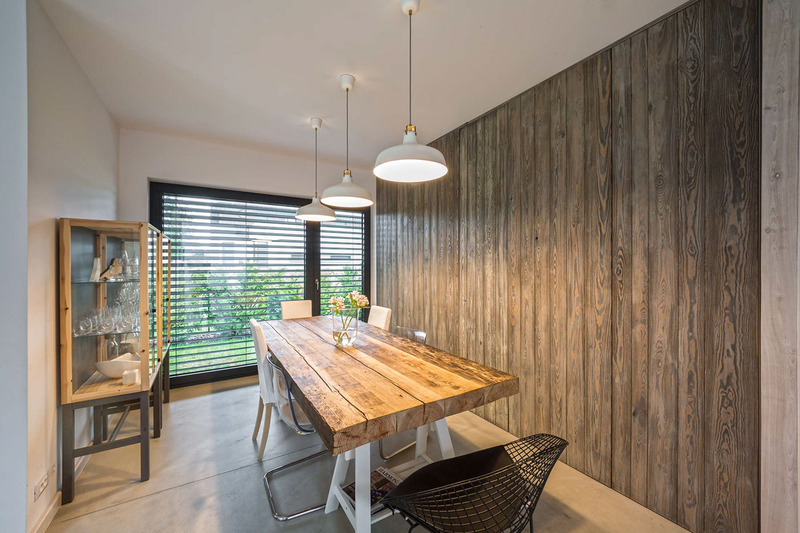 Downstairs in the dining room, grey wood mixes with warmer hues. A glass-and-wood cabinet reflects the textures of the library, while white adds light in painted walls, hanging lights and table legs. A woven pod chair welcomes visitors in, while the wall moves to accommodate them. 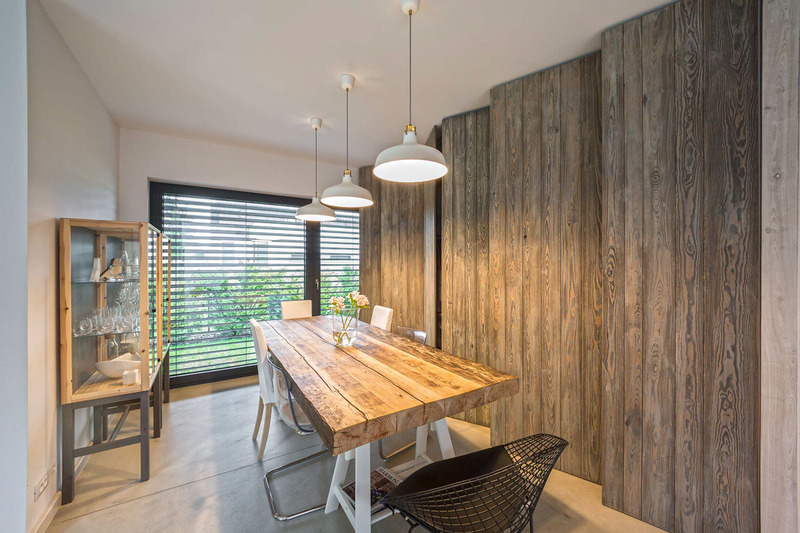 Downstairs in the dining room, grey wood mixes with warmer hues. A glass-and-wood cabinet reflects the textures of the library, while white adds light in painted walls, hanging lights and table legs. A woven pod chair welcomes visitors in. 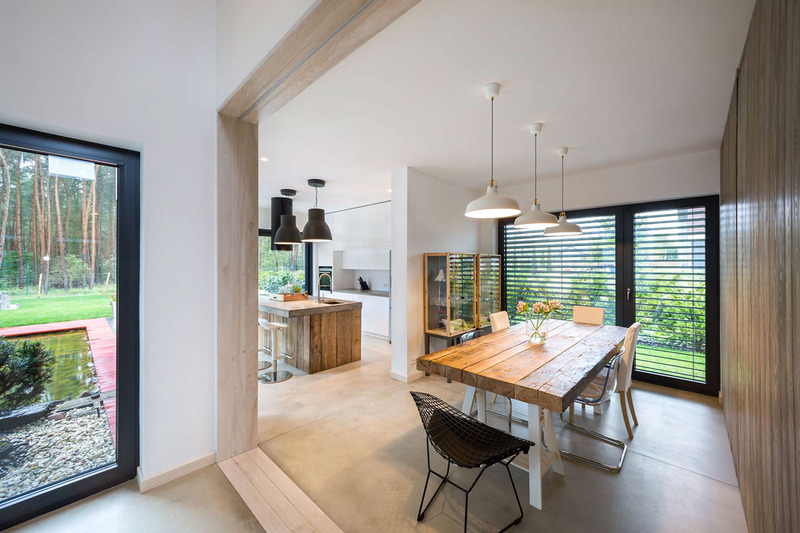 Another shared family space, the kitchen peeks behind the dining room in black, white and wooden features. 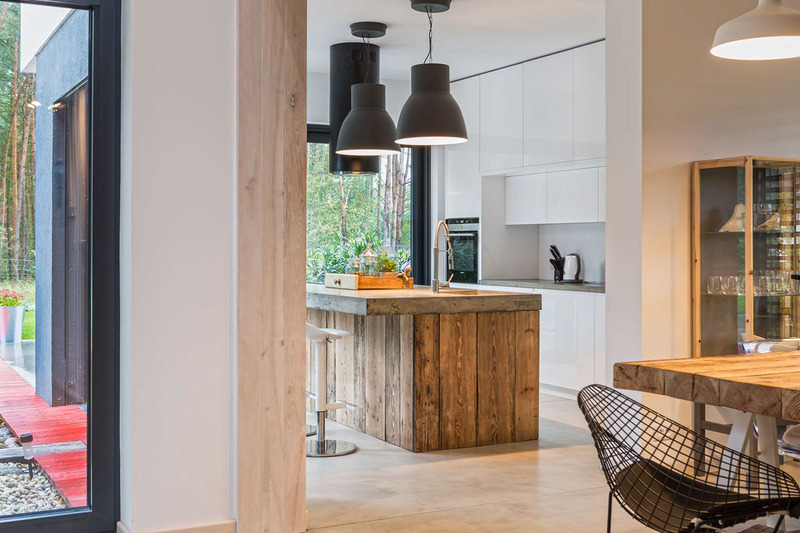 A concrete floor and lacquered white cabinetry provide a canvas for a rustic bench holding a slab. 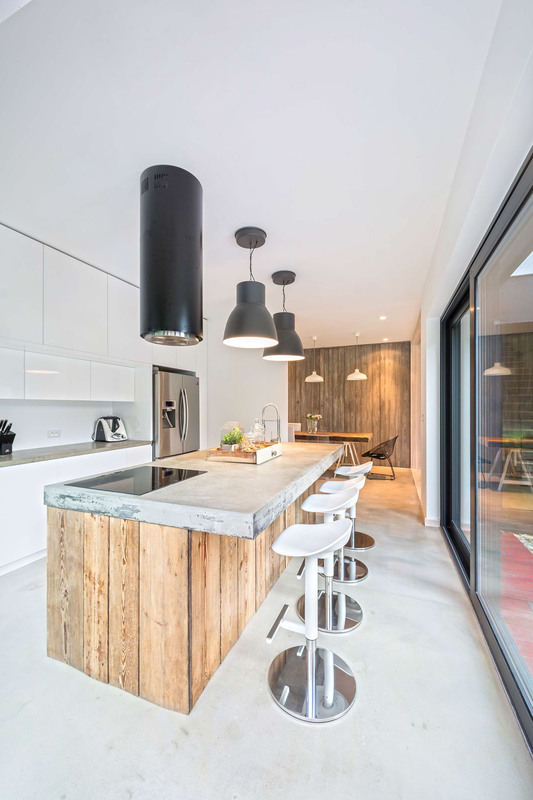 Rounded black features in an extractor fan and lighting play off white stools and a chrome fridge, adding the modern. 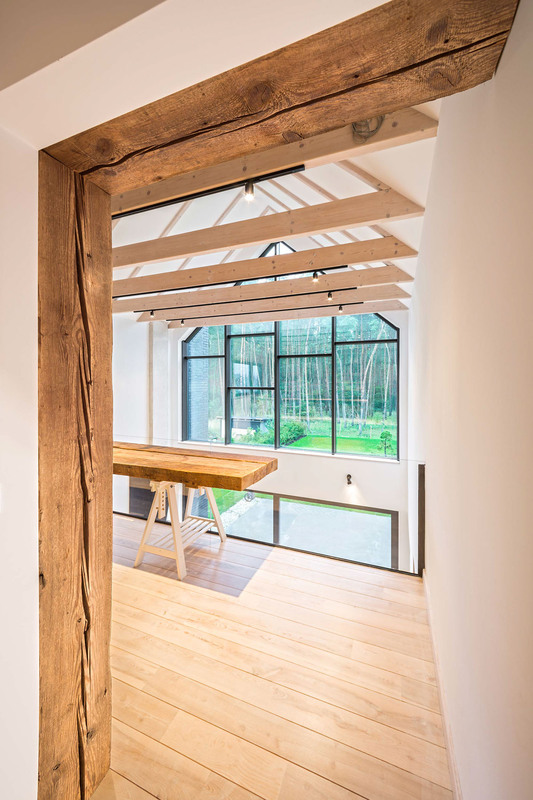 Wide-paned windows framed in heavy black let the outside in. Past the kitchen and dining room, a treat lurks under the staircase. 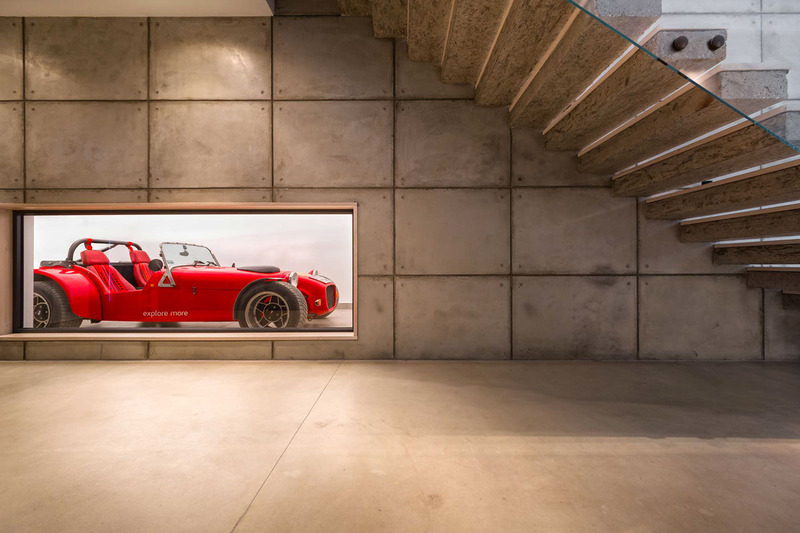 Large-format concrete leads to a showcase garage, featuring a legal track car in racy red. 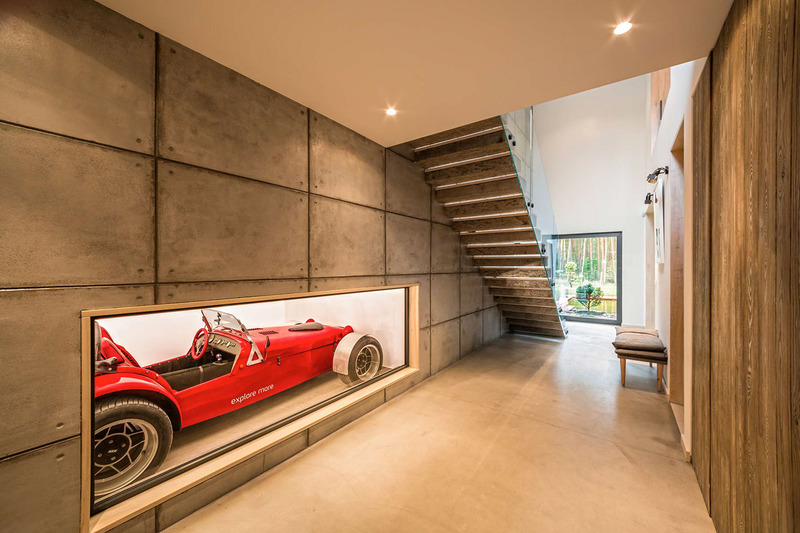 The focal point of this open-plan home, its red draws the eye from the dining, living and kitchen areas. A subtle grey bench offers a place to take in its beauty. 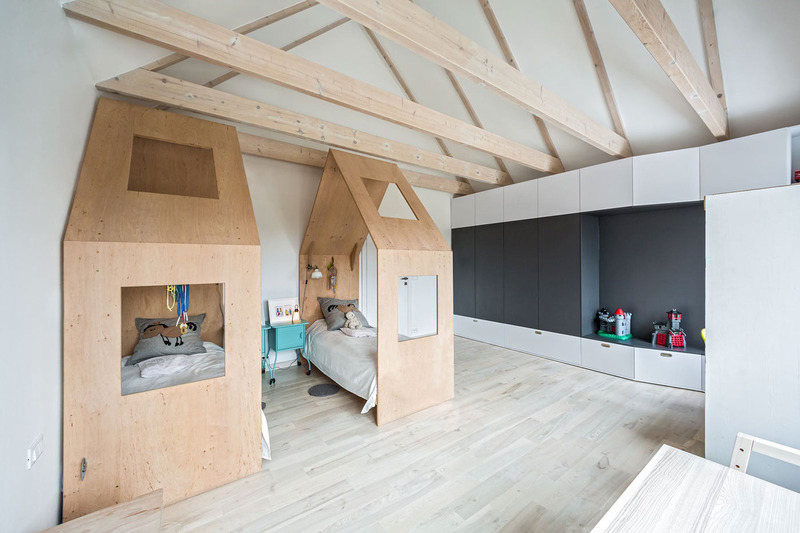 The bedrooms create spaces for adults and kids to play – separately. 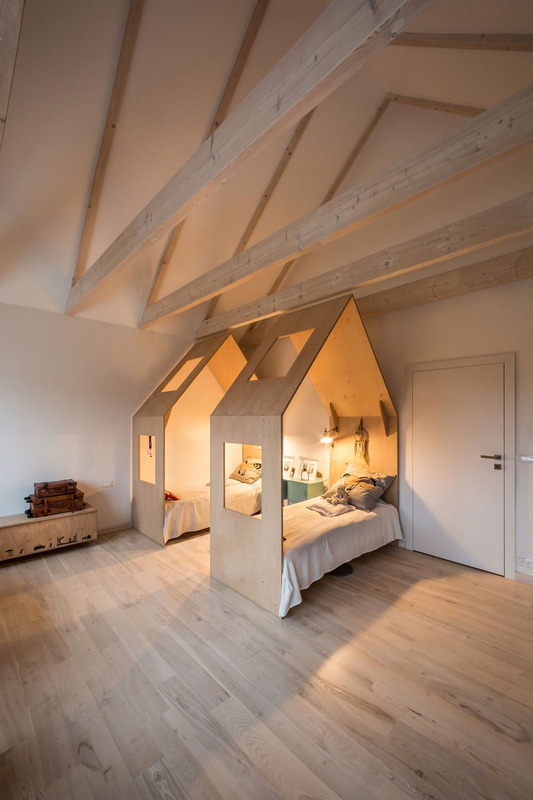 Located on opposite sides, they each feature a triangulated ceiling. 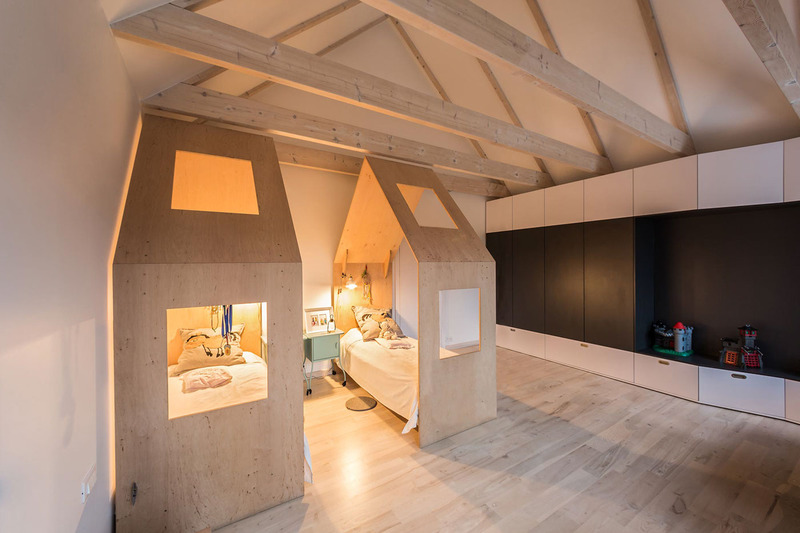 The kids’ bedroom offers a safe haven in a modern attic style. 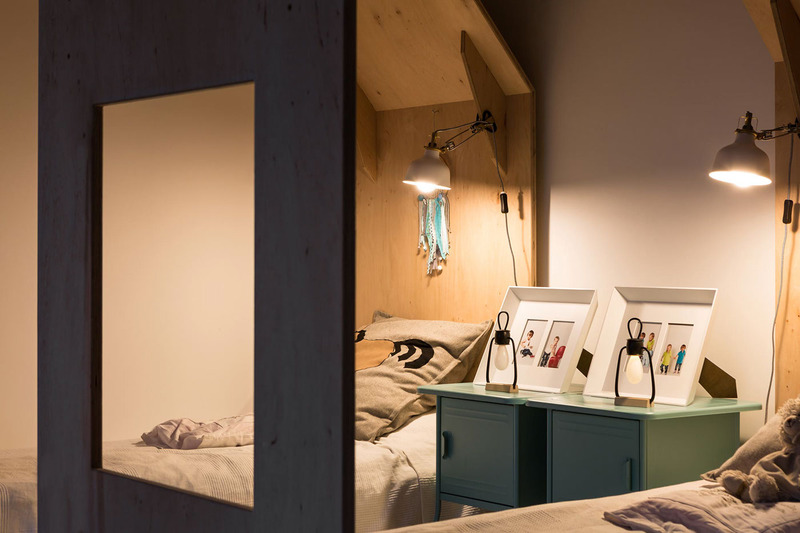 Drenched in light wood, it opens to two tepee house frames with twin teal bedside tables. 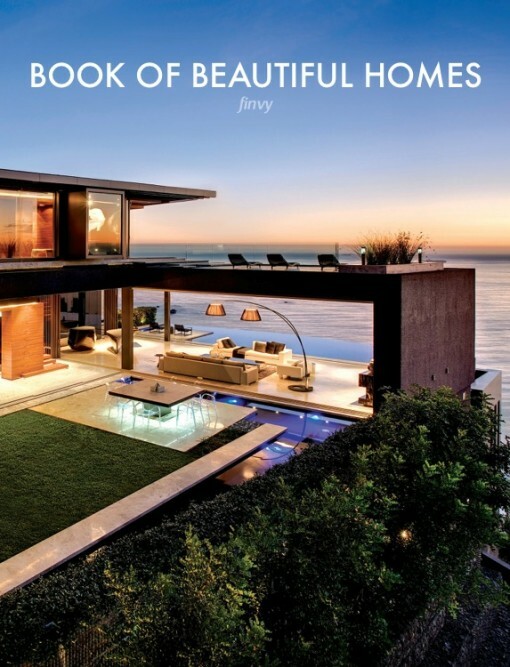 Open windows on their top and side let in daylight, glowing amber at night. 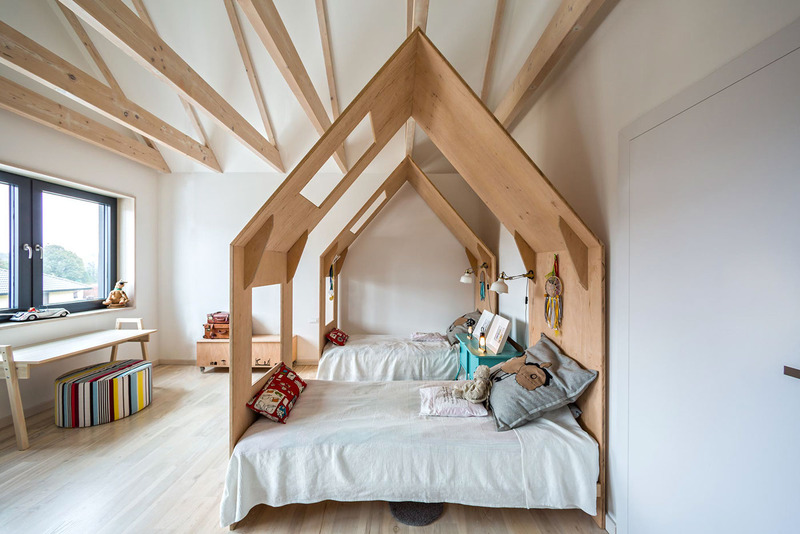 Light-wooden ceiling trusses and a monochromatic wardrobe panel structure the space. A bench desk faces the window, with a rainbow-coloured ottoman as a seat. 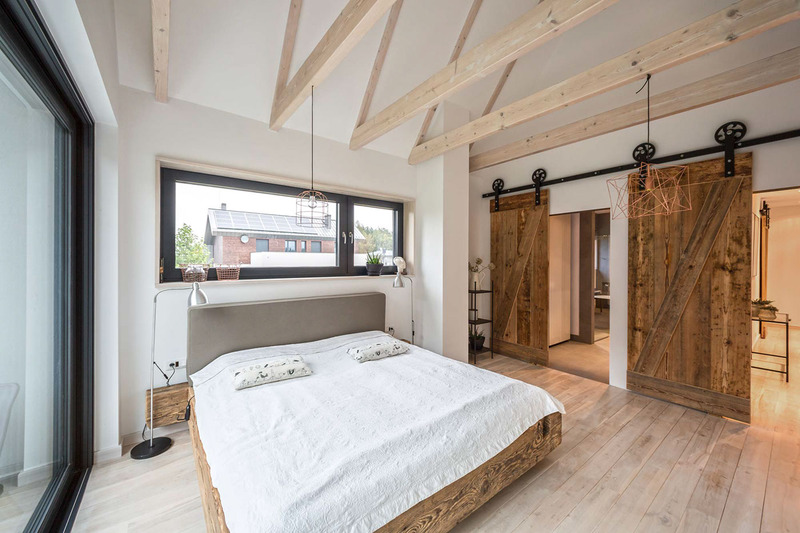 On the opposite side of the house, parents sleep in rustic tones. 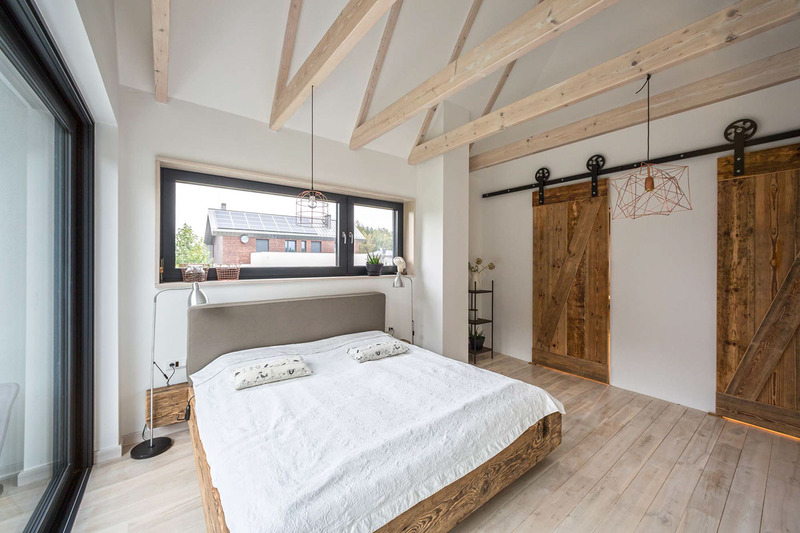 Light-wooden floors and trussing reveal an area made wide by both doors and sliding windows. 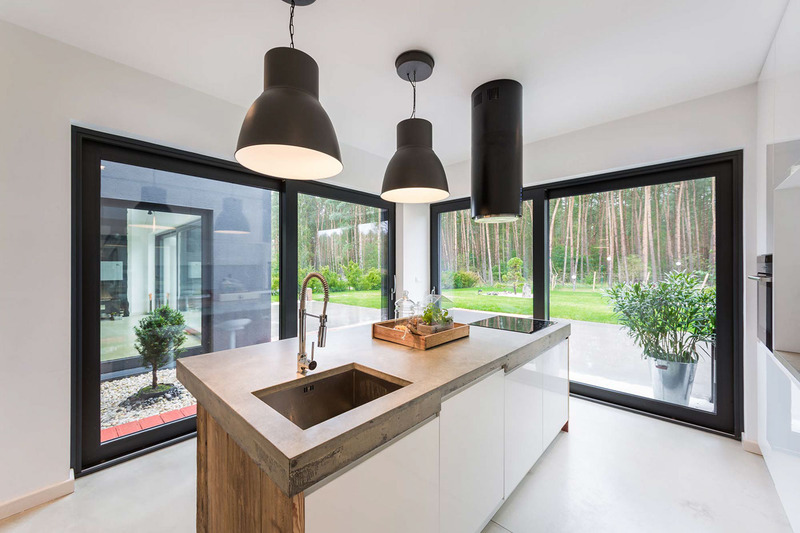 Large, black-framed panes from the kitchen open up the forest, while iron-sliding barn doors extend to the corridors. A distressed wooden bed frame, black iron shelving and cobweb chandelier add character. 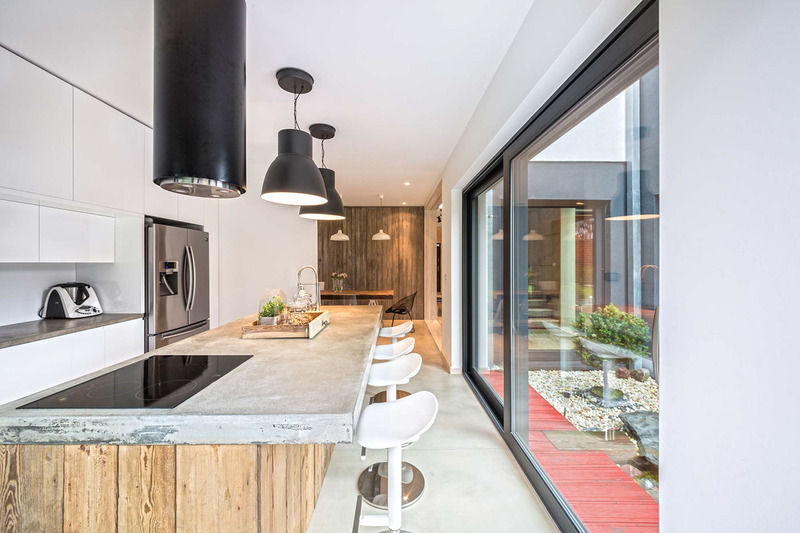 Sliding windows reveal an outdoor balcony. 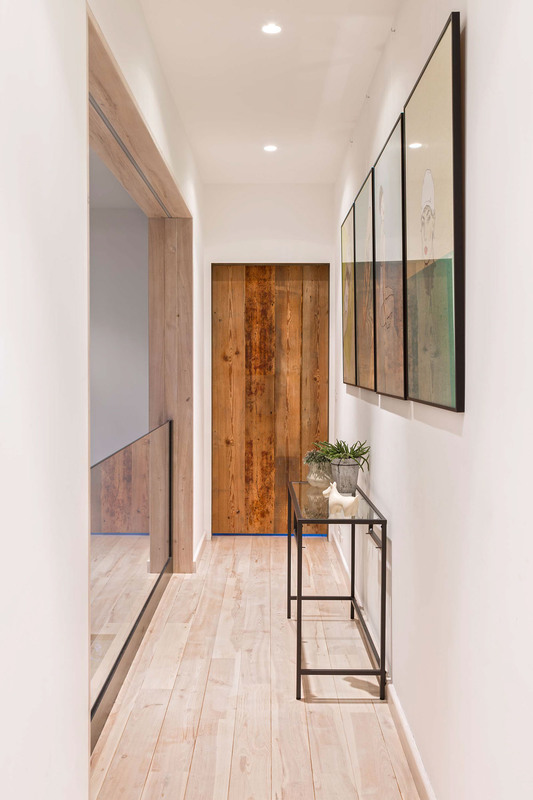 The corridors are a showcase of materials used. 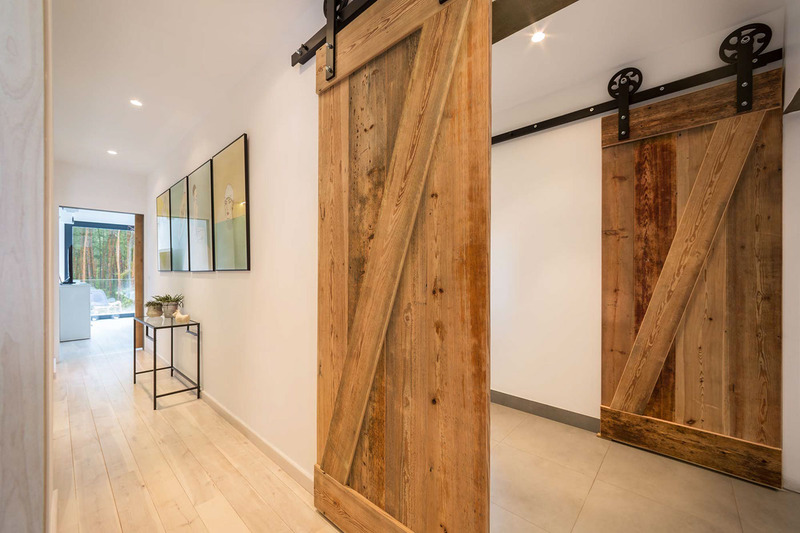 From the bedroom to the hallway, distressed wood mixes with glass and iron. 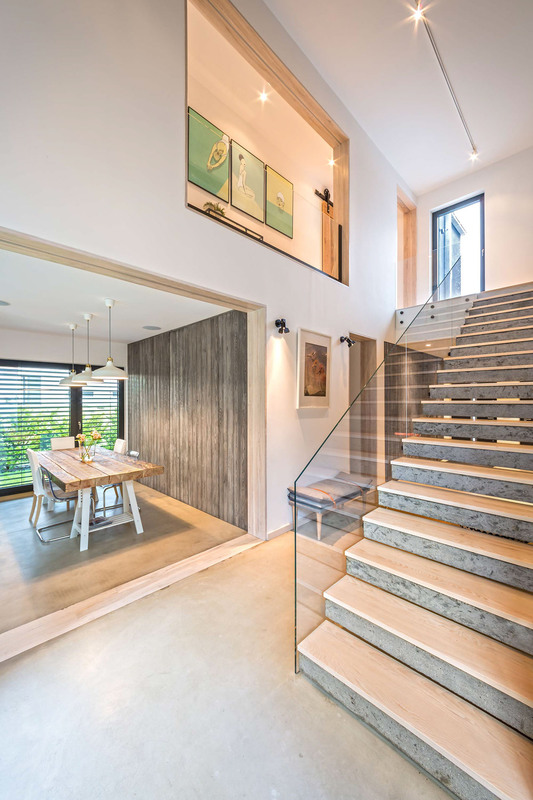 From the top of the stairs, white, light wood and concrete reign king. 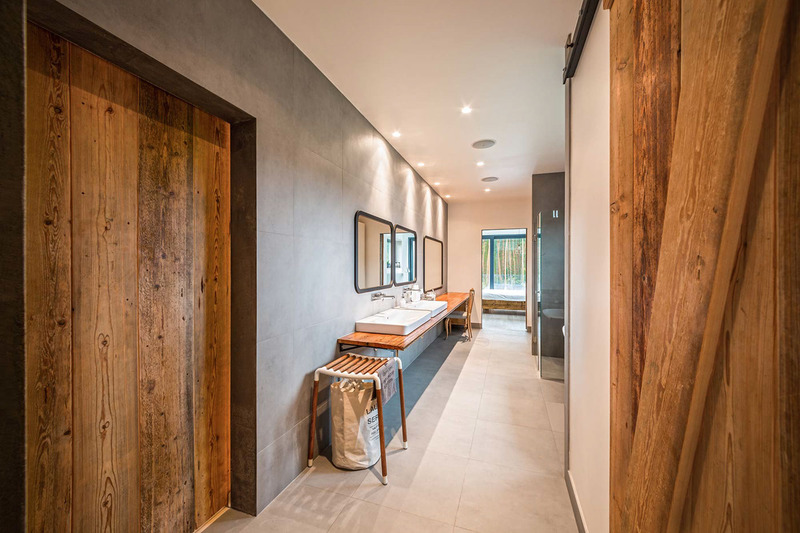 Towards the bathroom, distressed wood and concrete complete a full circle. Two bathrooms show both adult and child personalities. 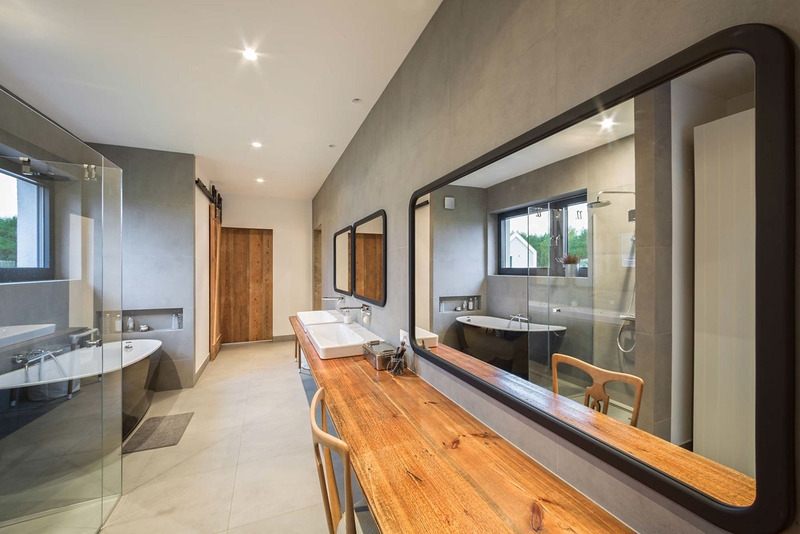 The master bathroom is slick and industrial, featuring polished, imperfect wood, a simple glass shower and luxurious wall-to-floor concrete. 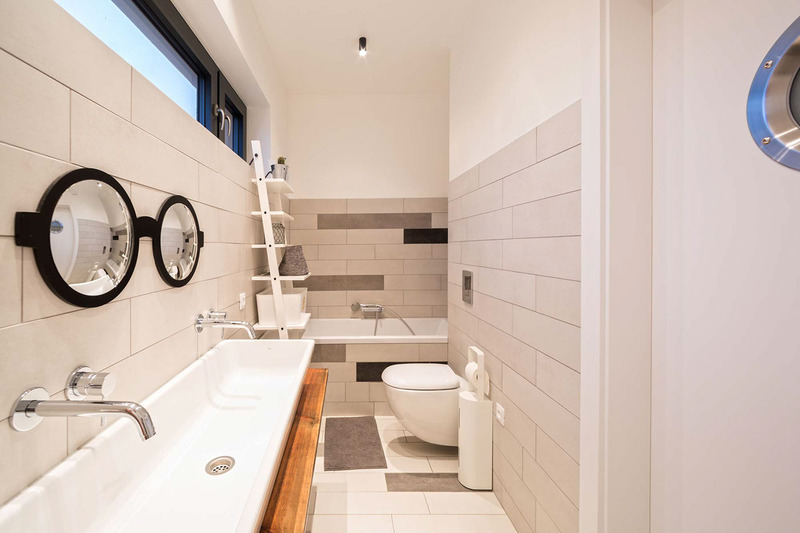 Bathed in white, the kids’ bathroom remains simplistic in porcelain amenities with pops of grey tiling. A black-goggled mirror adds an element of play. 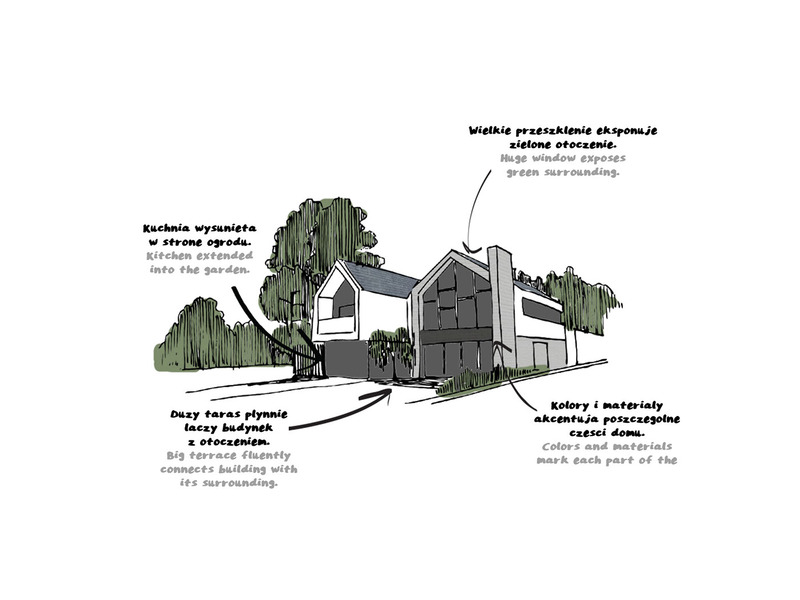 See the drawings below for an overview of the home’s layout.